After becoming involved in a lie, a voyeuristic artist begins to feel someone is stalking her. 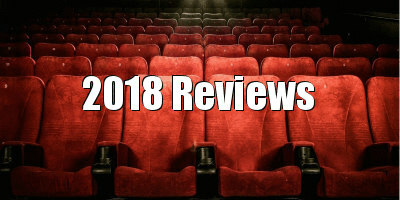 Many thrillers have successfully explored the premise of a tortured protagonist attempting to make sense of something they believe they saw (Blow-Up; Deep Red) or heard (The Conversation; Blow Out). 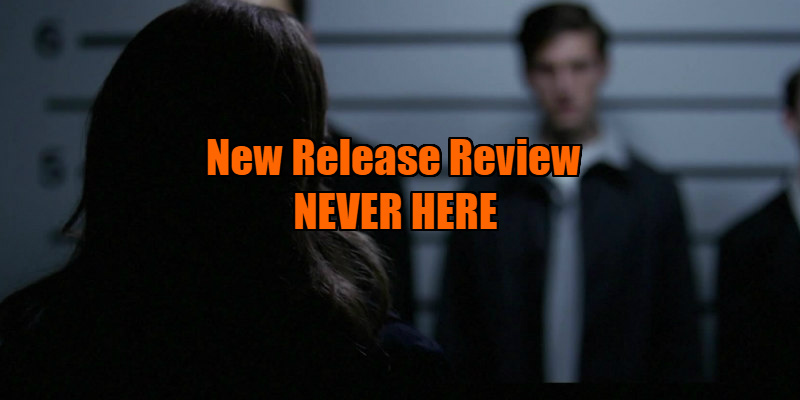 Writer/director Camille Thoman presents a twist on this concept with her debut, Never Here, which features a protagonist who lies about witnessing a violent incident and subsequently attempts to find the culprit using someone else's unreliable descriptions. Thoman comes from a background of performance art, and it's in the New York art scene that she sets her narrative debut. The Killing star Mireille Enos is Miranda (might she perhaps be named as a cheeky nod to controversial artist Miranda July? ), a successful artist who specialises in projects that intrude on the lives of others, sometimes willingly, like one in which Miranda asks her subjects to empty their pockets and display the contents thereof; sometimes unwillingly, like her latest gallery opening, based around her discovery of a cellphone and her investigation into the contacts and details contained within. At the opening, Miranda is confronted by Arthur (David Greenspan), the owner of the cellphone, who now finds the minutiae of his life (including childhood pictures Miranda obtained from his mother) on display in Manhattan without his consent. "You've done a bad thing," Arthur quietly tells Miranda in a passive-aggressive manner before leaving. That evening, Miranda returns home with her buyer, Paul (Sam Shepard, looking as healthy as most men half his age in his final screen role), who has been cheating on his sickly wife with the younger artist. While in the bathroom, Miranda hears Paul making a commotion. He tells her he witnessed a man bashing a woman's head into the pavement on the street below. Miranda insists on calling the police, but not wanting his affair to be revealed, Paul has Miranda lie and pretend it was she who witnessed the incident. This leads Miranda to become more involved in the case than she initially would have liked, but when she feels she recognises one of the men in a police line-up, she becomes obsessed with him, and her investigation into his life provides the subject of her next art project. However, it seems that someone may be stalking Miranda, with her gallery display attacked and her apartment broken into. On the big screen, Enos has struggled to find roles worthy of her talents, and Never Here makes you wonder why she isn't a bigger star. She's excellent as a somewhat disturbed, narcissistic artist so obsessed with voyeurism that she appears to be incensed that someone else witnessed the sort of dramatic incident that might have fuelled her own creativity. Her Miranda reminded me a lot of Faye Dunaway's violence obsessed photographer in The Eyes of Laura Mars, another movie in which a female artist is drawn into a potentially dangerous scenario, not altogether unwillingly. Miranda may be the protagonist of this thriller, but she's also the scariest of its characters, oblivious to how her intrusive art might affect the lives of her subjects, the pawns in her self-obsessed game. The film around her doesn't quite live up to Enos's performance however. At close to two hours it drags in parts, with a couple of subplots that don't really add anything to the narrative, particularly one involving a rekindled relationship between Miranda and an old college lover (Vincent Piazza) who now just happens to be the detective assigned to her case. Thoman's handheld camera adds to the theme of voyeurism, but it makes for a decidedly ugly film. Perhaps most problematic of all is the lack of any real threat to the film's protagonist, which results in the viewer struggling to engage with Miranda's dubious actions, rather than simply watching in judgement. More interesting than the rather generic, giallo-esque central narrative is the story that has already occurred at the point the film begins; that of Miranda's solipsistic requisitioning of Arthur's cellphone, and subsequently his life, for the sake of her art. This seems like a narrative with far more originality and dramatic potential than the one that eventually plays out. Should Thoman reenlist Enos for a prequel, I'll certainly cast my voyeuristic gaze over it. 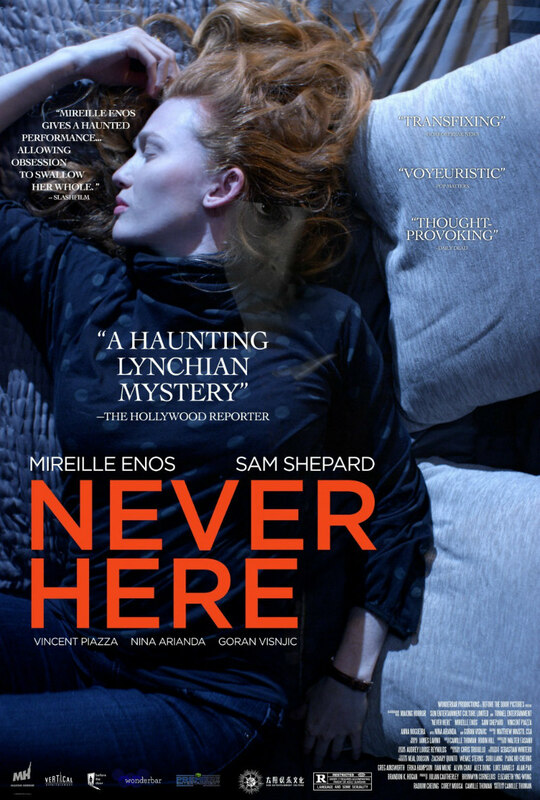 Never Here is in UK cinemas September 21st.